Articles→Breaking News→First Place Goshen Retreat Bra Decorating Contest Goes To Team Kauffman Medi Spa! First Place Goshen Retreat Bra Decorating Contest Goes To Team Kauffman Medi Spa! Goshen Health Breast Surgeon Laura Morris, left, presents the first place award to Jennifer Kauffman, Melissa Kuhn, Lisa Estep and Sarah Anderson. GOSHEN — Kauffman Medi Spa brought home the gold in the 11th annual Bra Decorating Contest! Proceeds benefited women in need of mammograms and support for those recently diagnosed with breast cancer, through Heart String Sisters. HeartStrings Sisters program provides this financial assistance for low incomes, medically underserved women in our community. 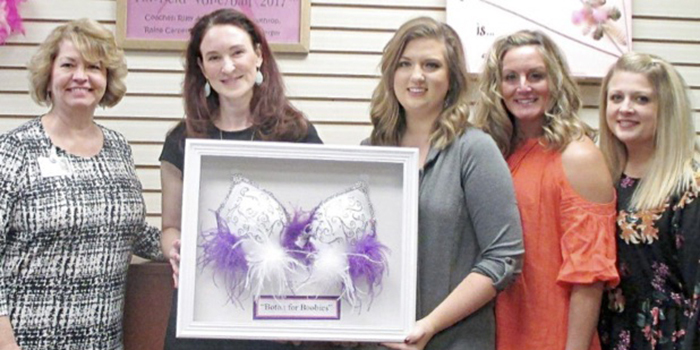 Goshen Retreat’s Women Health Center, Goshen Health, annually holds a decorated bra contest, encouraging businesses and individuals to design, decorate and donate. “I am so proud of my team, our patients, and the community we live in, for supporting this breast cancer prevention cause,” said Jennifer Kauffman, CEO, NP of Kauffman Medi Spa. To view all 2018 contest entries, visit goshenbracontest.org. Kauffman Medi Spa, Inc.is located on SR15 in Warsaw and provides the latest medical anti-aging options. To schedule a consultation, call (574) 267.1900. Or, locate further information at kauffmanmedispa.com.